To the sounds of "God Save the Queen" over 100 residents got together on the Green in Roe Lane on Saturday 2nd June 2012 to celebrate the start of Her Majesty the Queen's Diamond Jubilee. Temperatures had dropped over night and it was looking decidedly dull and cold but this did not deter the arrival of cakes & scones to the Tea Tent. Peter Cormack, MBE, did a splendid tour of the village for residents. 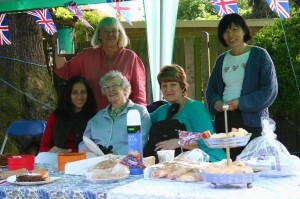 Shortly after, more residents arrived and as the sun came out and warmed the day, everyone relaxed in the sunshine for a chat over a cuppa and home made cakes. Remembering those days when one went to the cinema and when the film ended one stood up at the end for the national anthem – so too did we all, to celebrate the Queen, on her 60th anniversary.